Most lobelia plants are annuals. They die back completely after the first frost and must be replanted from seed or as transplants in the springtime each year. But several types of lobelia plants grow as perennials, meaning they survive the winter as dormant plants and regrow year after year. For perennial lobelia, careful preparation of the planting site for winter will ensure a successful regrowth each year for the life of the plant. Most perennial lobelias, including the great blue (Lobelia siphilitica), cardinal flower (L. cardinalis) and their related cultivars maintain an above-ground basal rosette of leaves throughout the winter. Plants enter a state of dormancy as weather grows cooler, indicated by a dying back of flowering parts and taller stems. Once the temperatures rise in springtime with the lengthening of days, bright green, new growth emerges from the basal rosette, which dies back as the new growth flourishes. After the plant has been in the ground for a year, gardeners may cut back dying growth in the fall; new plants should be allowed to retain all of their current-season growth, as this will help protect the plant during its first winter. Ensuring the plant is properly placed to begin with is key to its eventual survival and success. Most lobelias can grow in part-shade conditions, though the great blue tolerates more shade than its cardinal flower cousin. Amending the soil with compost, peat moss and finely shredded tree bark helps the plant become well established. Though planting in spring guarantees enough time for plants to develop a healthy root system by the following winter, lobelia planted during late summer and early autumn also generally become well established by winter. Contrary to logic, winter sun is more harmful to dormant plants than cold temperatures, though a lower-than-average freeze can be just as dangerous. When exposed to unseasonably warm temperatures, plants may be fooled into breaking dormancy, and new foliar and root growth will be quickly killed once temperatures return to normal winter lows. Gardeners should strive to provide an environment in which winter temperatures are more or less constant, and mulch is one way to accomplish this. Considering which areas of the yard will be sunny in winter when they are normally shady will help the gardener determine which areas may need extra protection during winter. By applying a 2- to 3-inch layer of mulch over lobelias and other dormant perennials, temperatures underneath remain steady, allowing plants to break dormancy at the proper time in spring rather than midwinter. Shredded pine bark, cypress, cedar and other wood-based materials make for the best mulches, as they decompose naturally and gradually amend the surrounding soils. One ready source of mulch in many yards is fallen leaves, which may be spread evenly over beds and will provide excellent protection from deep freezes. Snow also acts as a natural insulator, so allow accumulations of snow to remain in the garden whenever possible. In general, only plants growing in pots will need minor watering during winter, unless the winter months are unusually dry. Though the above-ground portions of the plant do not grow during winter, the roots are still alive and well, and lack of snowfall or other precipitation during the winter may necessitate periodic watering. 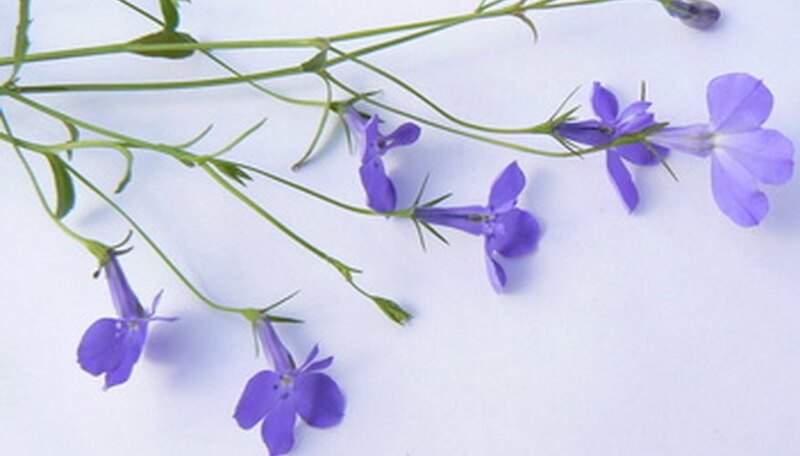 As most lobelias are tolerant of periodic drought conditions, only water them during winter if the ground is excessively dry. The tiny bright blue blooms of the annual lobelia are a delight, but only for the warmer growing months during the year. Unlike its perennial cousins, annual lobelia dies back completely in the winter, though some types may grow from seed in the spring. Many annual lobelias are cold-tolerant and will survive longer into late fall or early winter than other types of annual flowers, but frost will kill them. Bringing a potted annual lobelia indoors once overnight temperatures approach freezing may prolong the plant’s life, but unless the gardener can provide adequate lighting, the plant will soon end its natural life cycle.